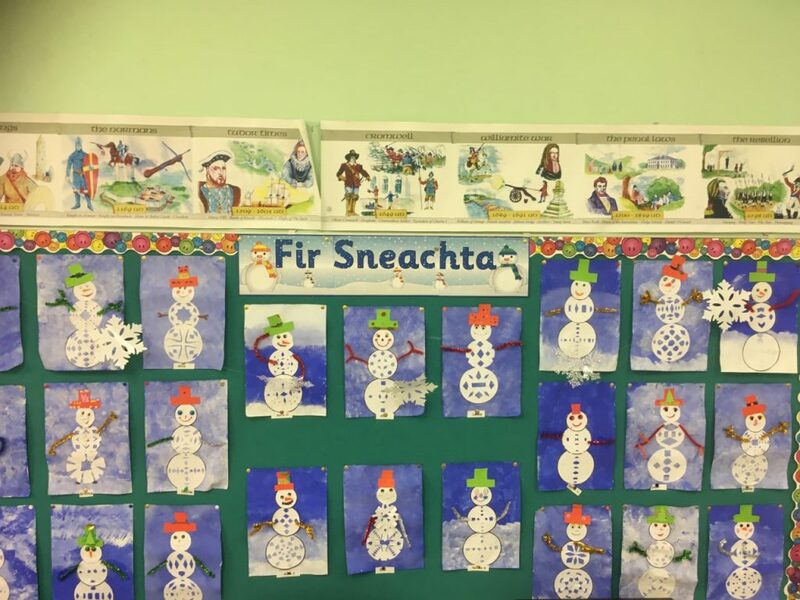 English is taught to all children from Junior Infants to Sixth Class. 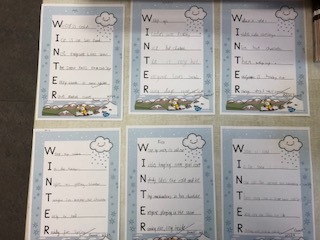 Oral language, reading and writing are all encouraged and promoted throughout the school. 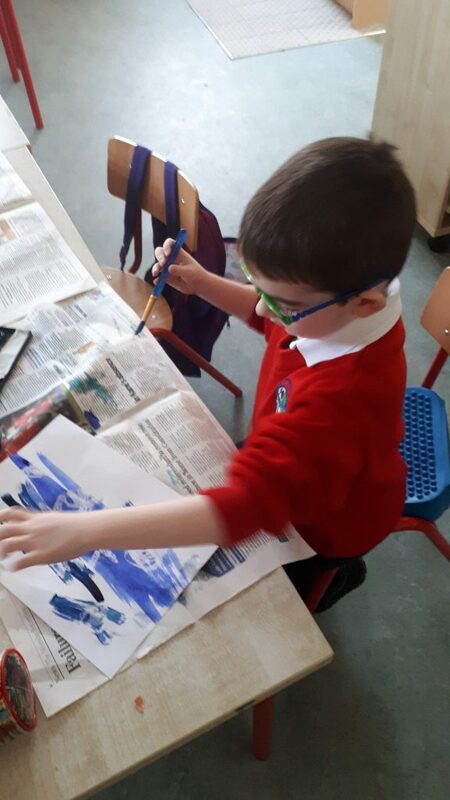 The child’s reading and writing experience in school can contribute greatly to their cognitive, emotional and imaginative development. 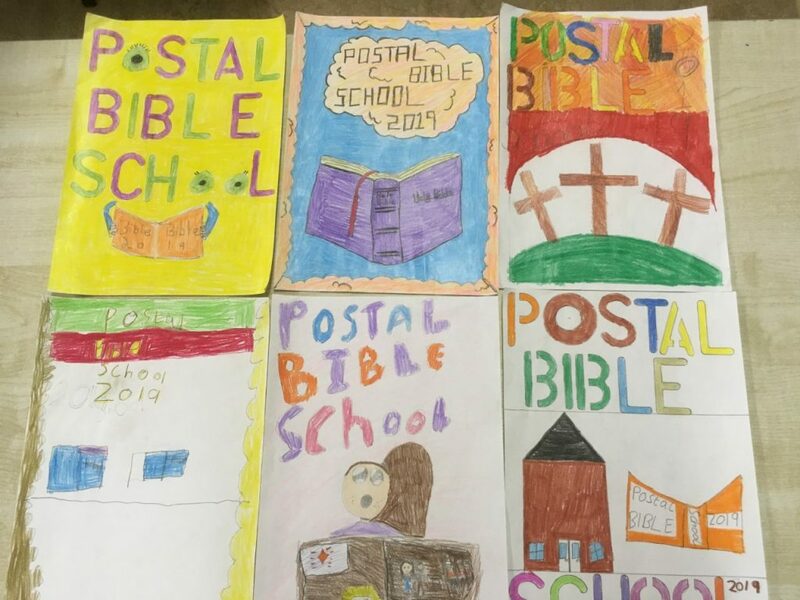 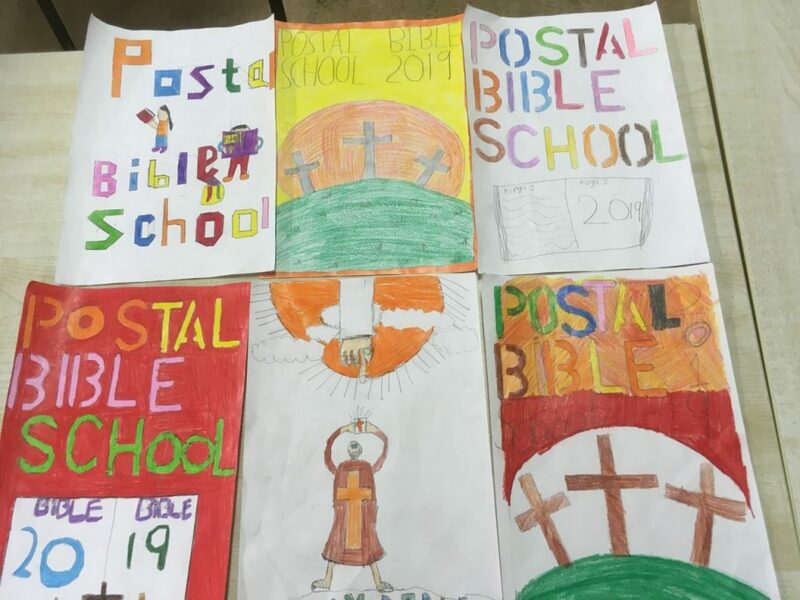 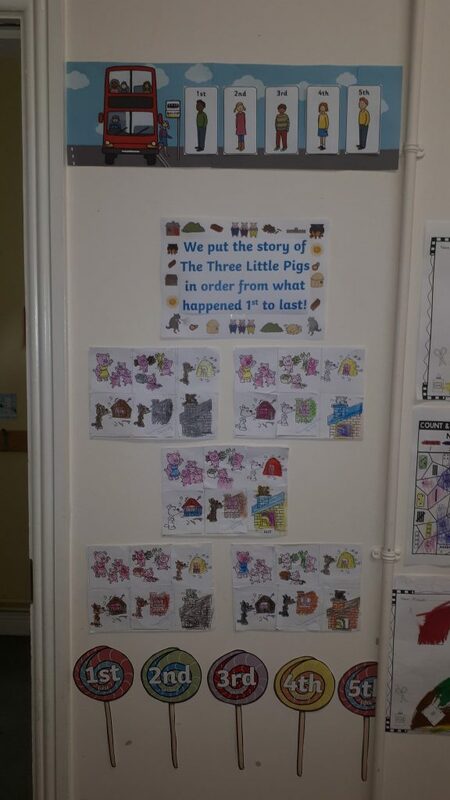 The children love to write stories, complete projects and post their blogs on the school website. 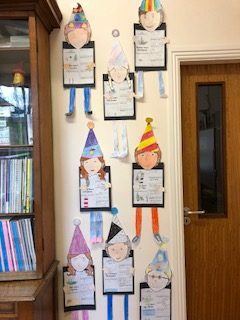 Happy New Year from the Junior Room! 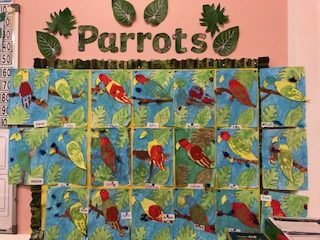 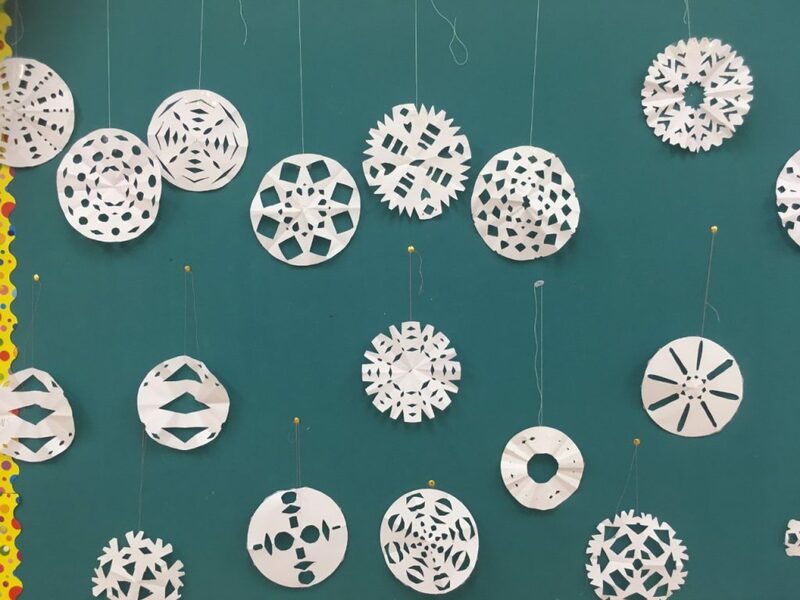 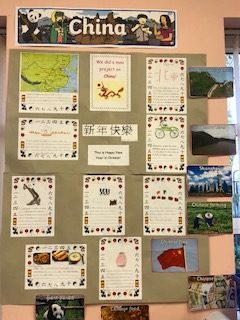 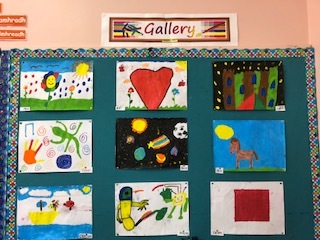 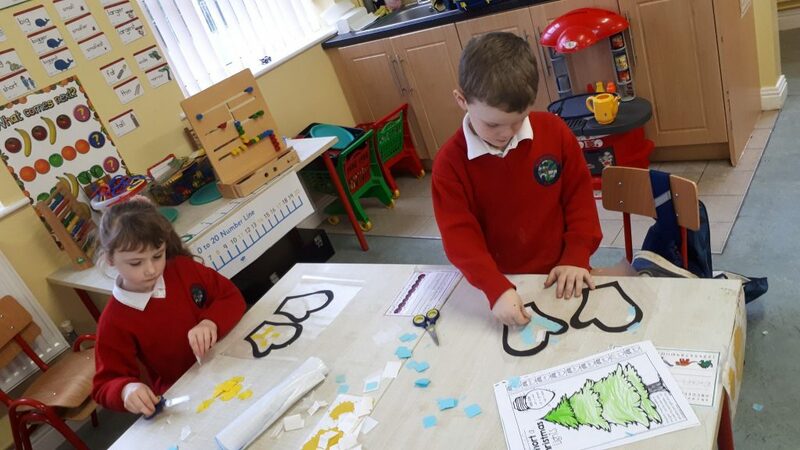 It has been a busy start to 2019 in the Junior Classroom. 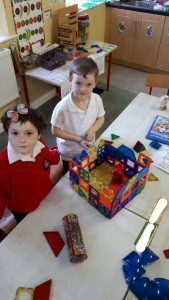 We’ve learned about lots of new and exciting topics. 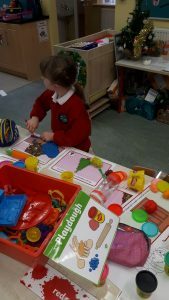 In play we learned all about School and The Pet Shop. 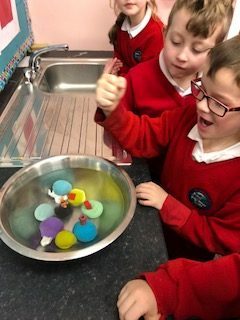 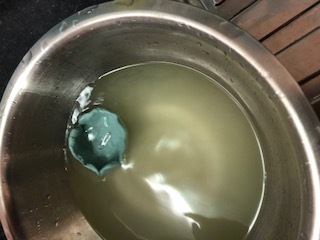 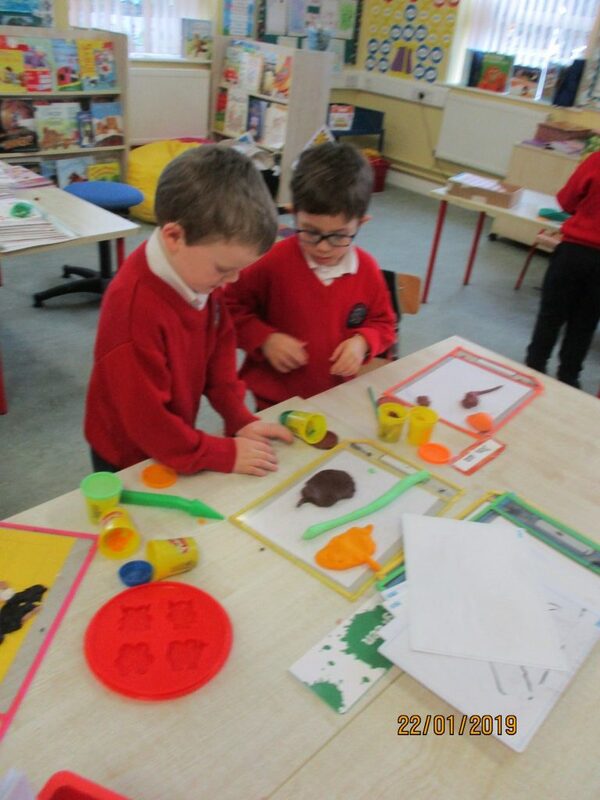 We made school items in Playdough. 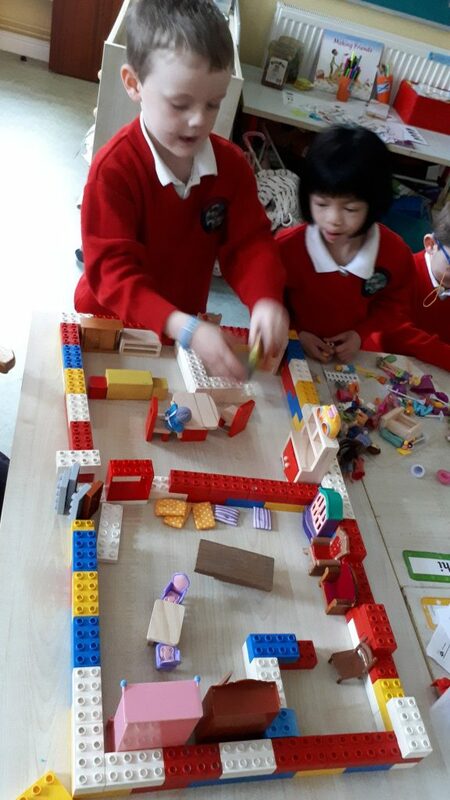 We built classrooms and schools in Small World and Construction. 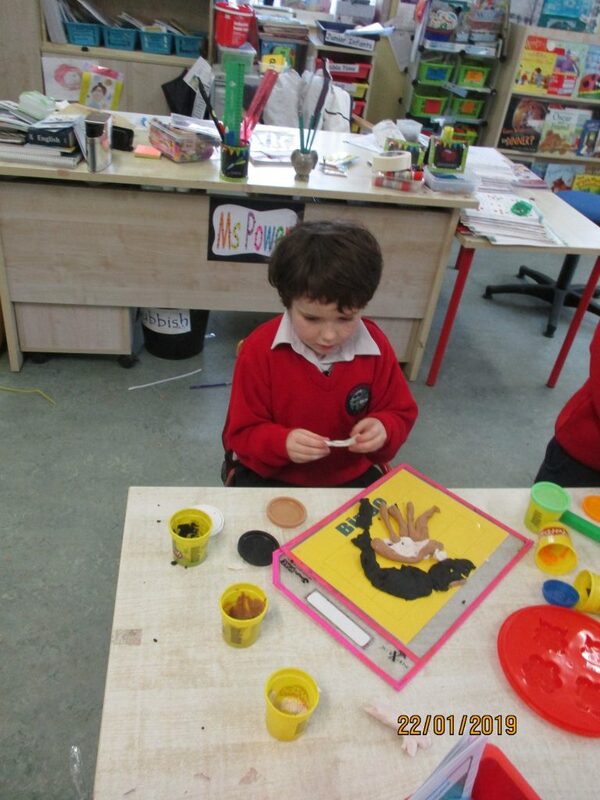 We made items in Junk Art. 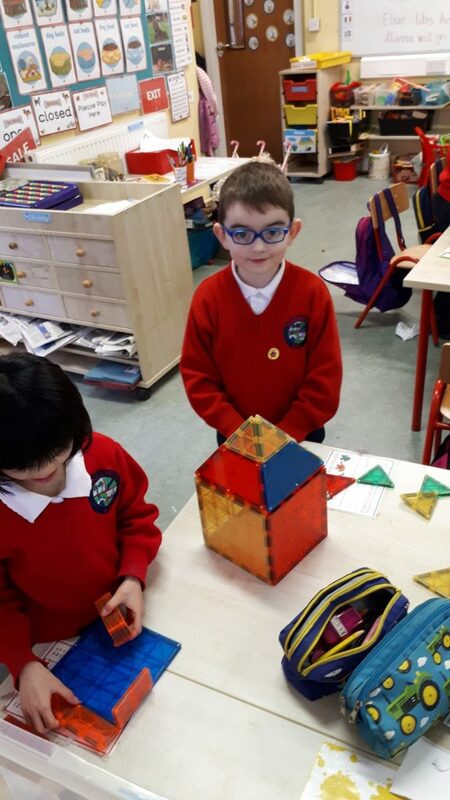 Making a clock for the classroom. 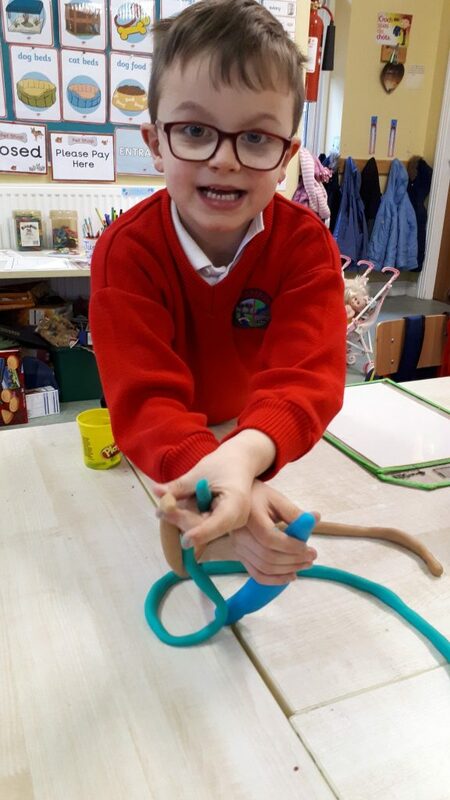 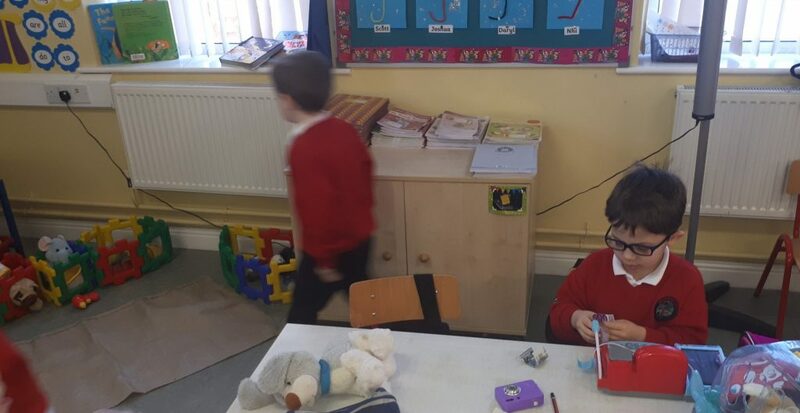 We also had fun in Role Play acting out in the classroom. 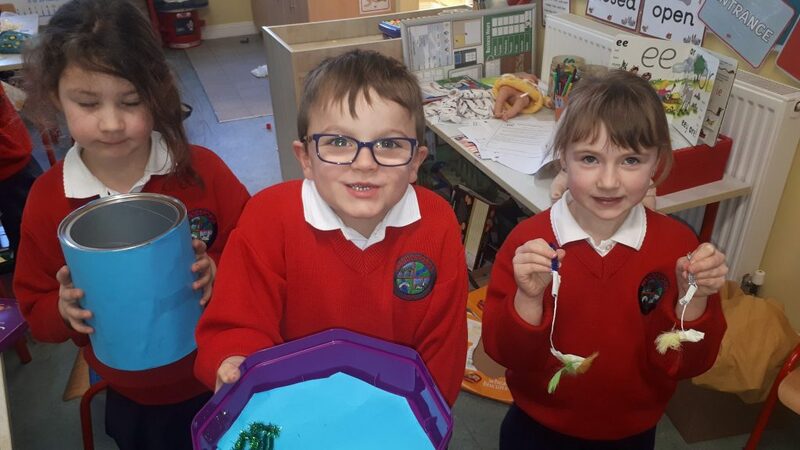 We also explored the theme of Pet Shops this month. 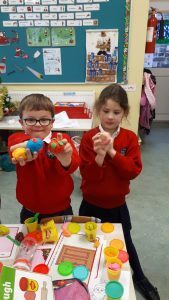 We made Playdough animals and pet related items. 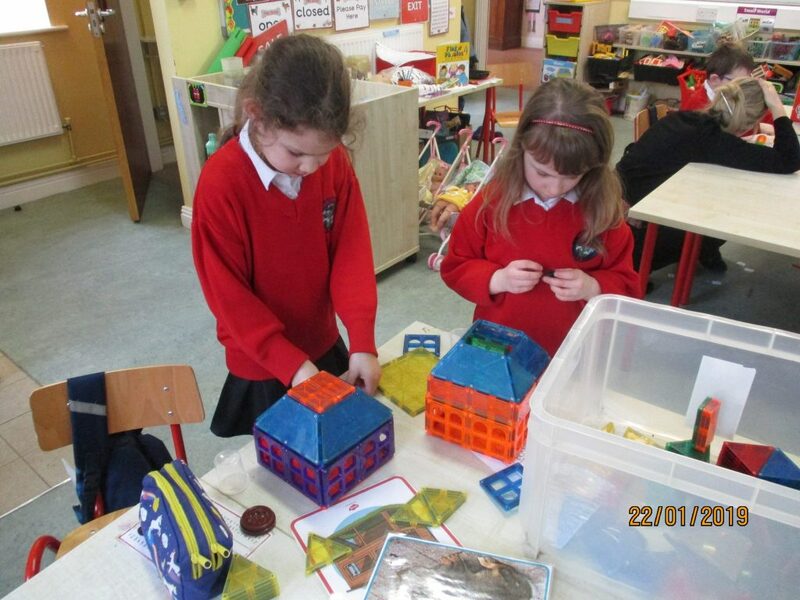 In Construction we made pet home like aquariums, rabbit and gerbil hutches and dog and cat baskets. 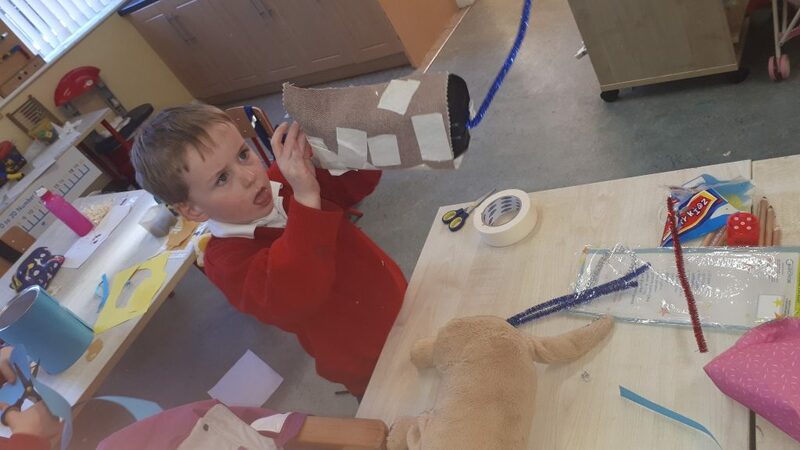 In Junk Art the boys and girls made pets and pet toys. 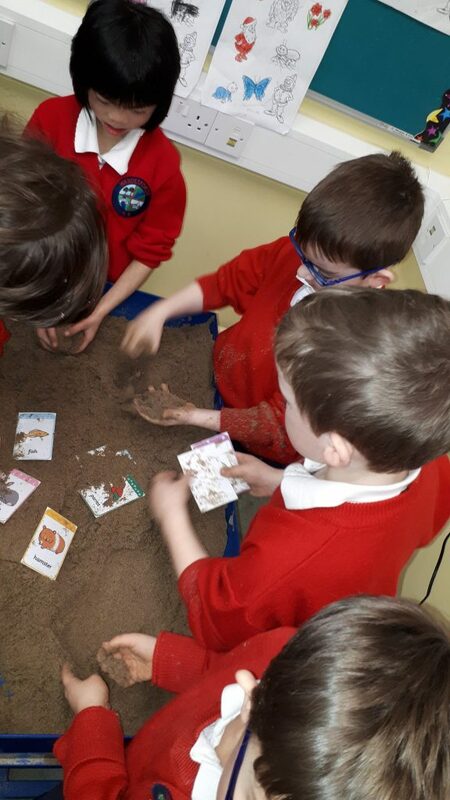 We found various pets in the sand and matched them to their homes. 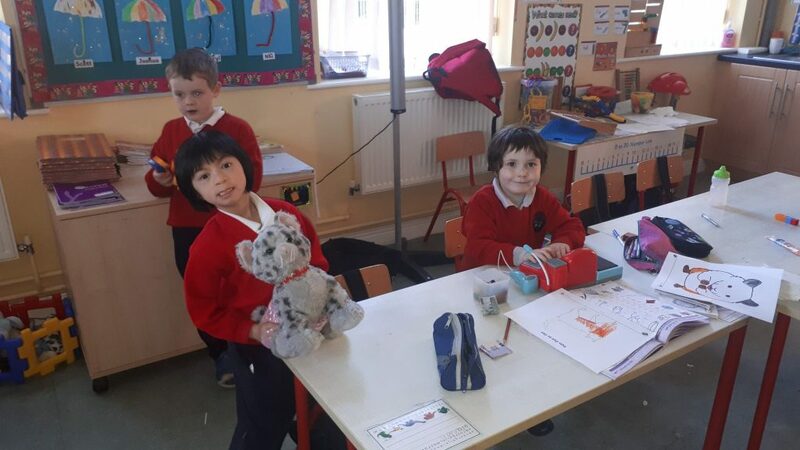 Finally we made our own pet shop in the classroom and enjoyed acting out going to the shop in Role Play. 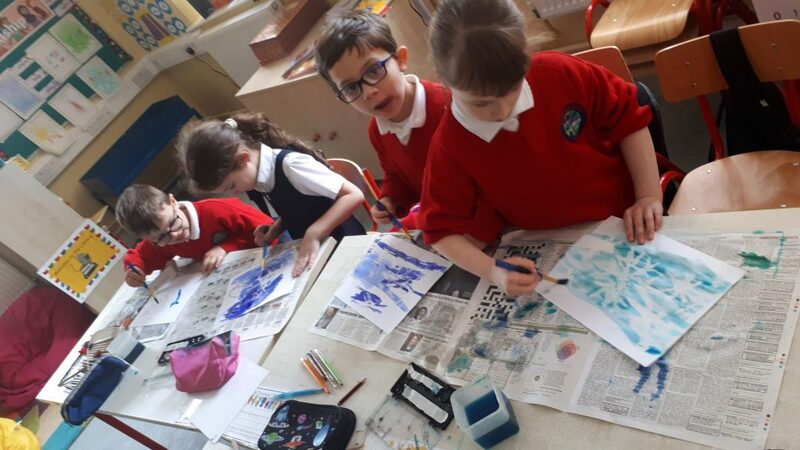 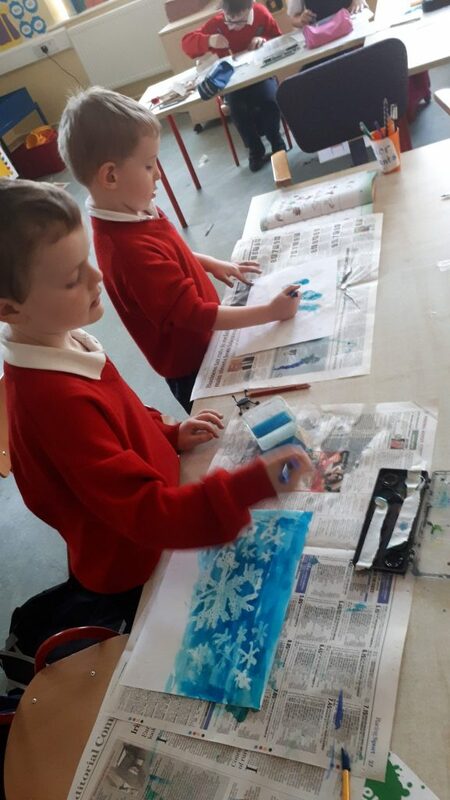 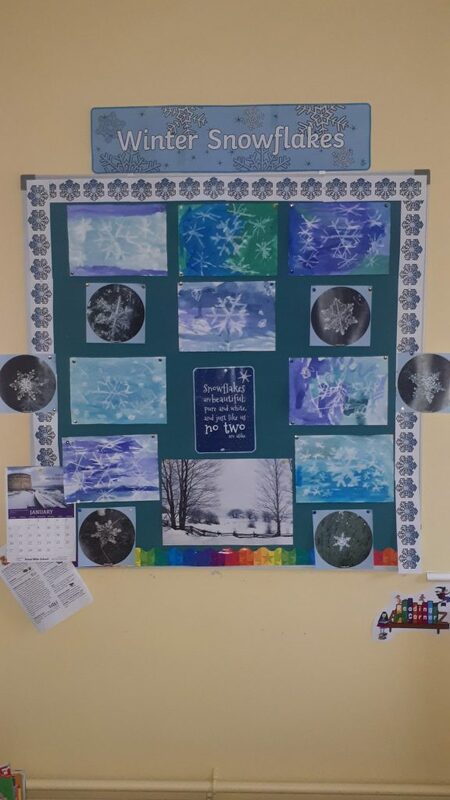 In Art we looked at the topic of Winter and made snowflakes using oil pastels and then painted over them with water colour paints. 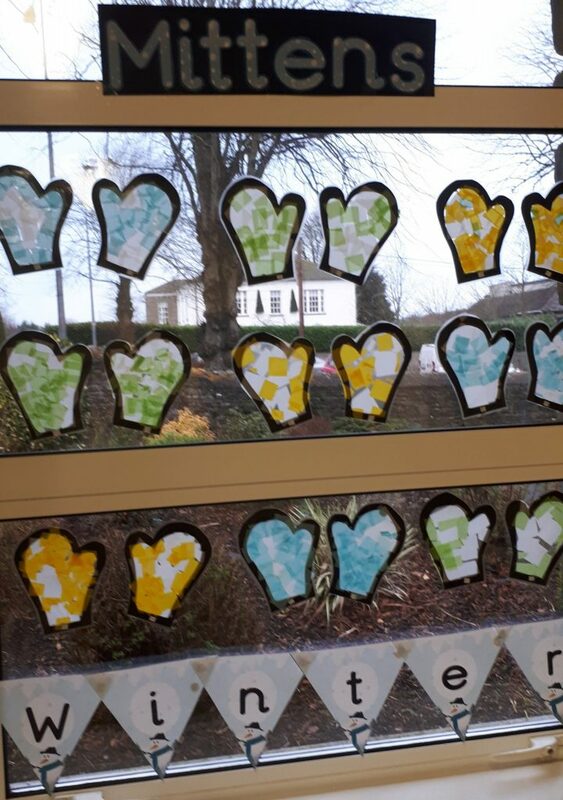 We made winter mittens from tissue paper and contact and put them on display on our classroom window. 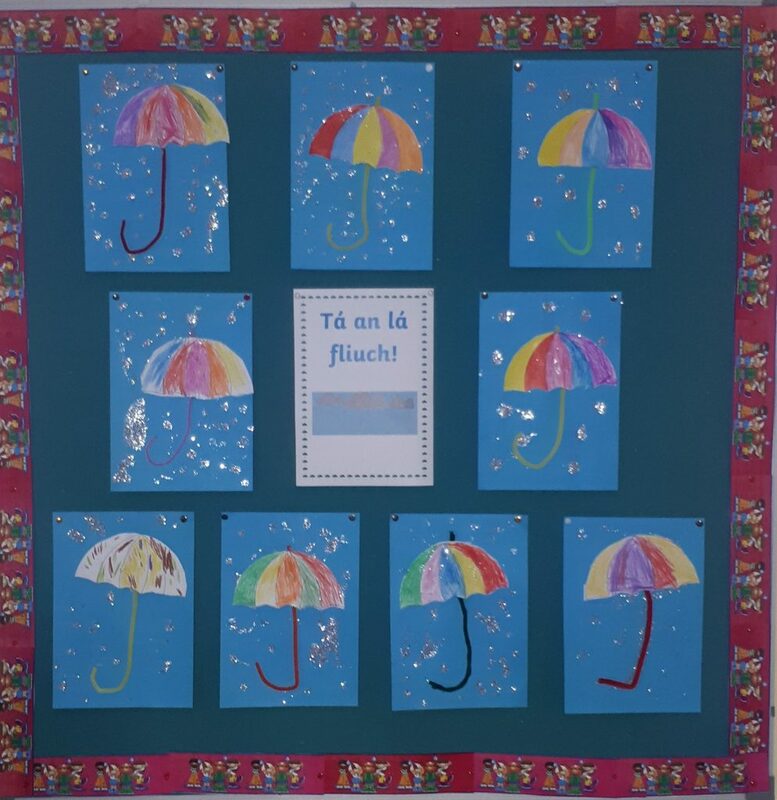 In Gaeilge we have learned all about ‘An Aimsir’ and made these colourful umbrellas. 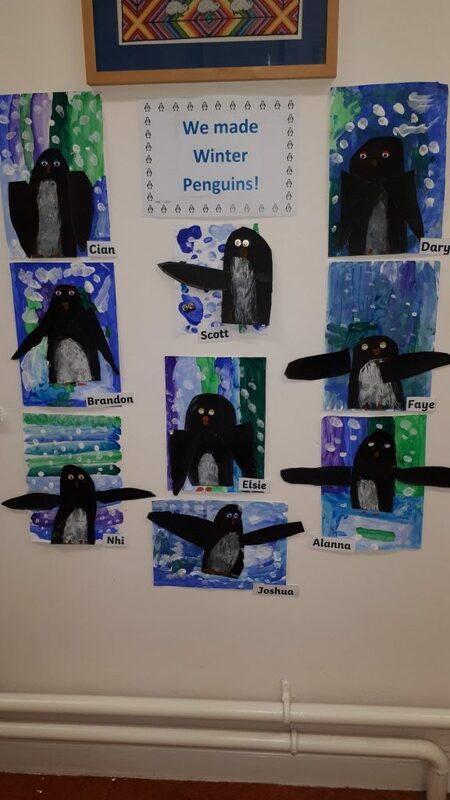 Finally we made Winter Penguins using ‘cold’ coloured paints for the background. 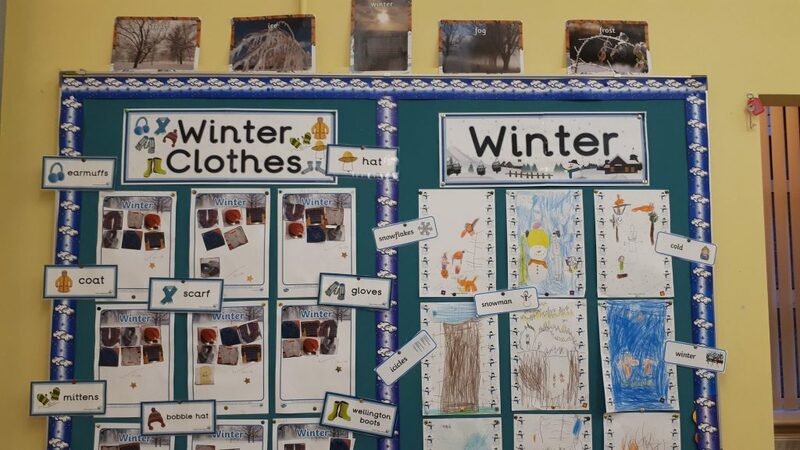 In SESE we learned all about the topic of Winter, we sorted some winter clothes and drew pictures of Winter Scenes. 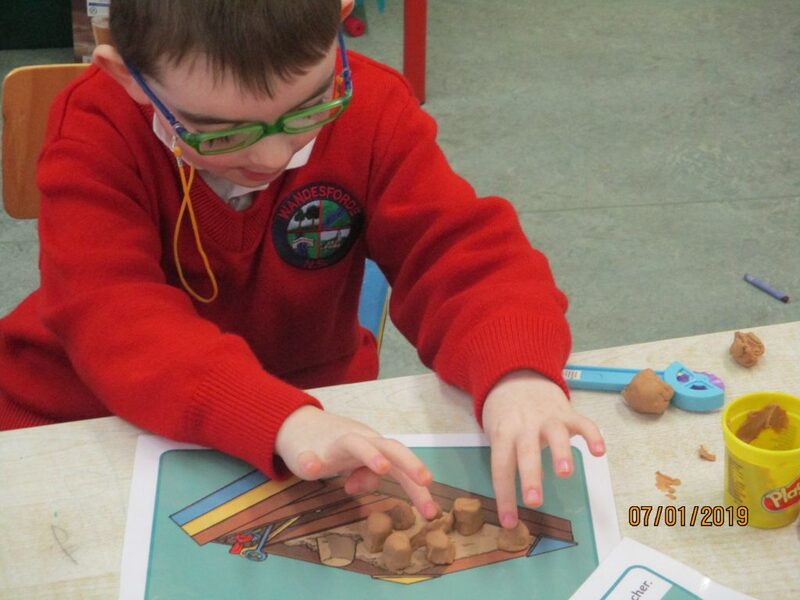 Also in SESE we were learning all about our sense of sight and hearing. 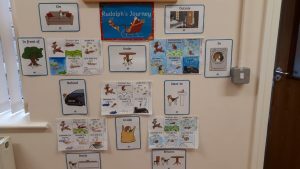 We went on a walk outside to listen for different sounds and played games about what we could see around us. 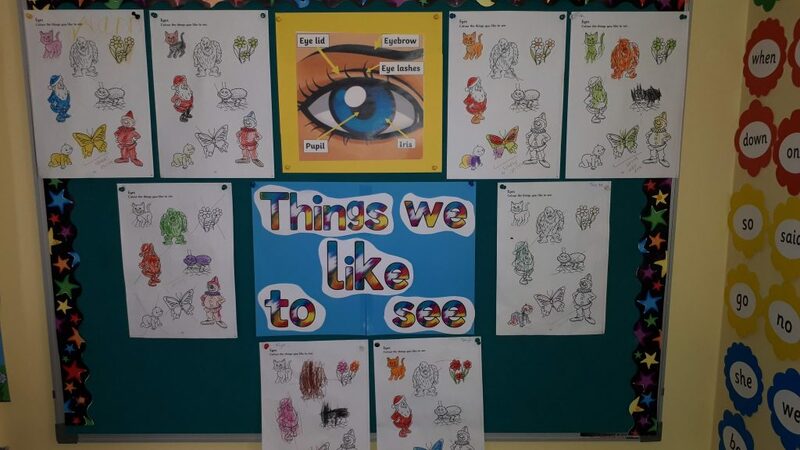 Then we coloured in pictures of things we like to look at and listen to. 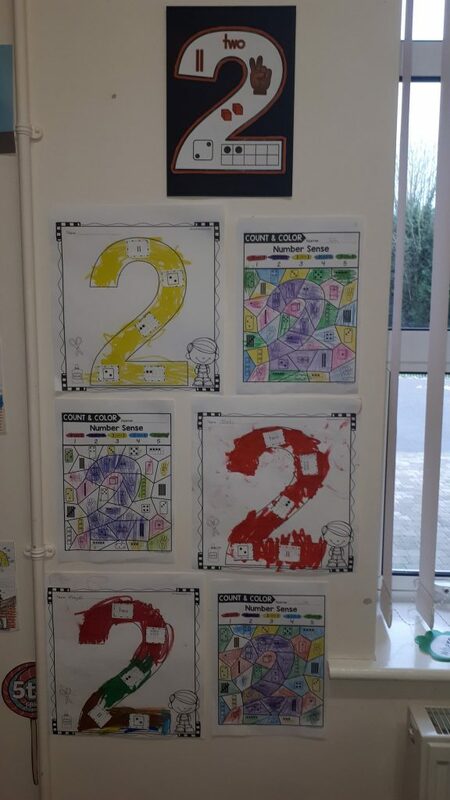 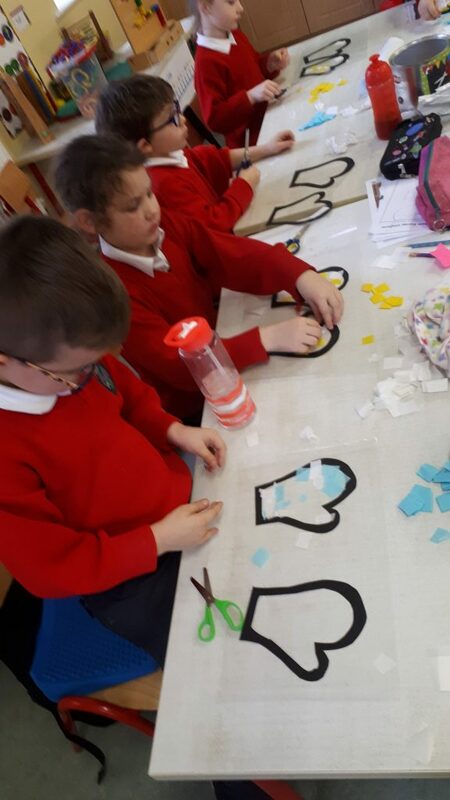 Junior Infants have been revising the number 2 in Maths, while Senior Infants were learning ordinal numbers, ordering stories from what happened 1st to last. 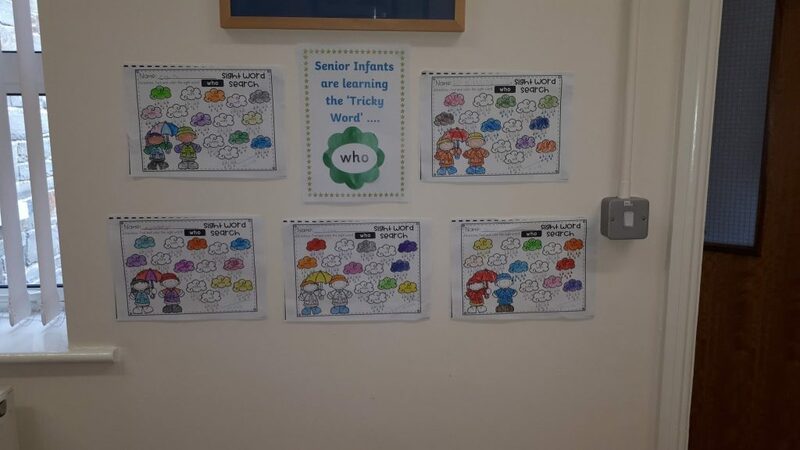 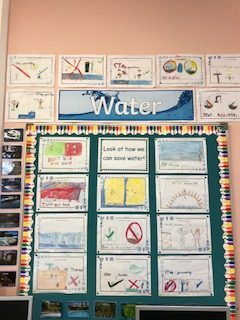 Meanwhile Senior Infants continue to learn new ‘Tricky Words’ each week. 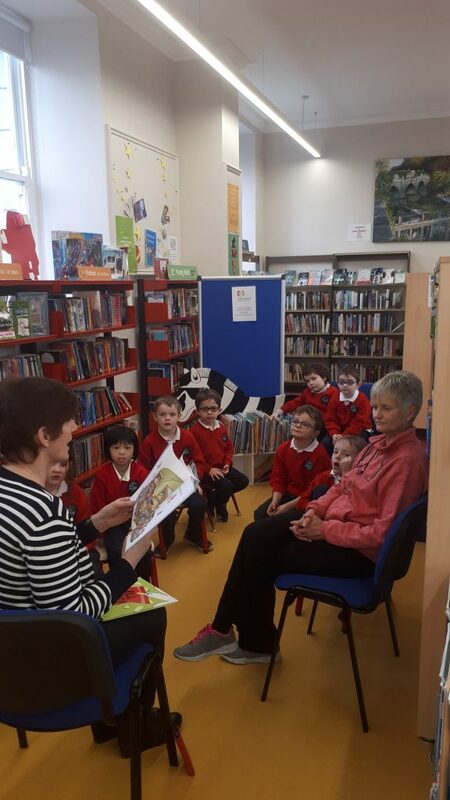 Finally, and also in English we had a lovely morning at our local library listening to stories and exploring books with Mary the librarian. 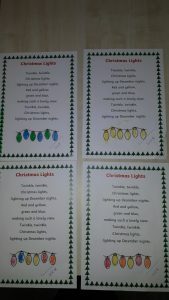 The Senior Room have been very busy in their preparations for Christmas. 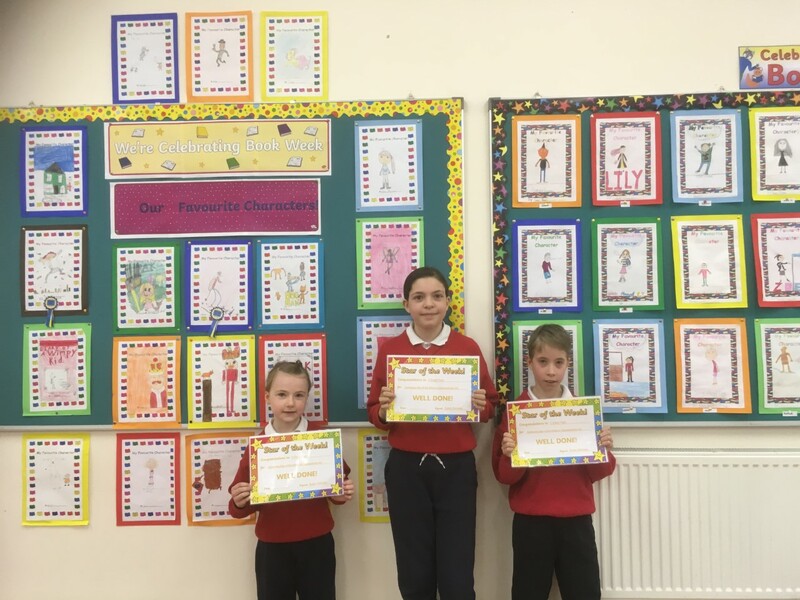 Below are some photographs of all their hard work in all aspects of school life. 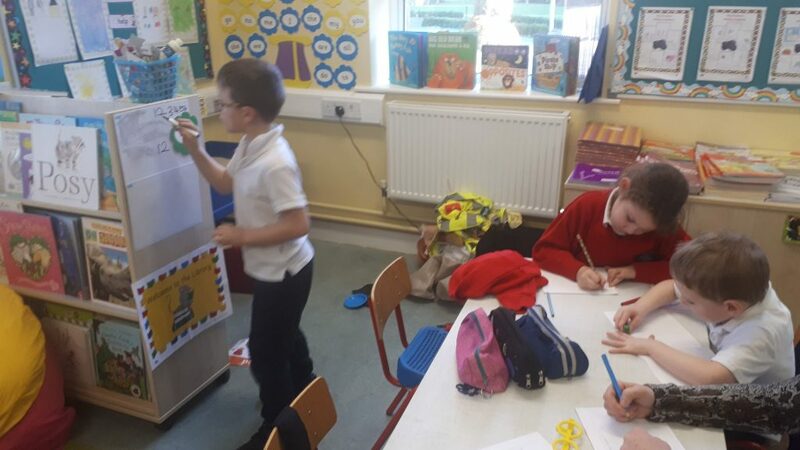 In Maths, the topic of fractions put us all to the test! 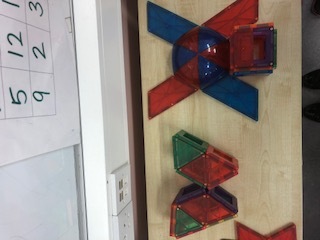 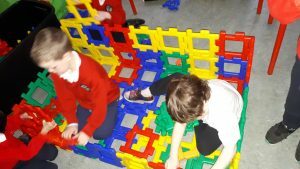 The children engaged in many class activities to reinforce this concept. 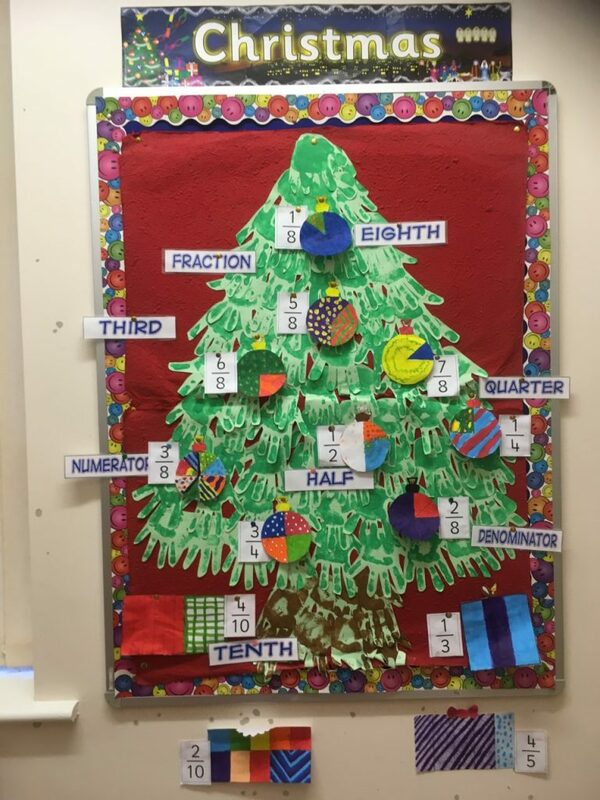 They particularly enjoyed getting fractions of various 2D shapes which we displayed as decorations on and presents under our Christmas Tree! 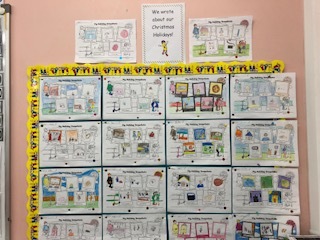 During the month, we explored the topic of “Me” in SPHE. 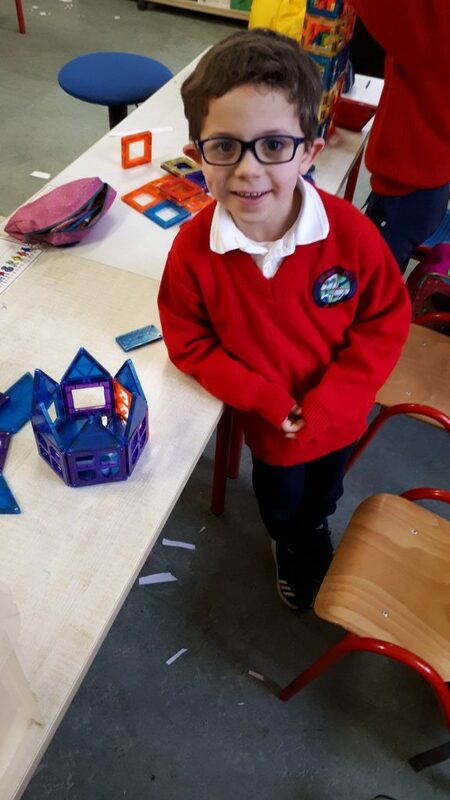 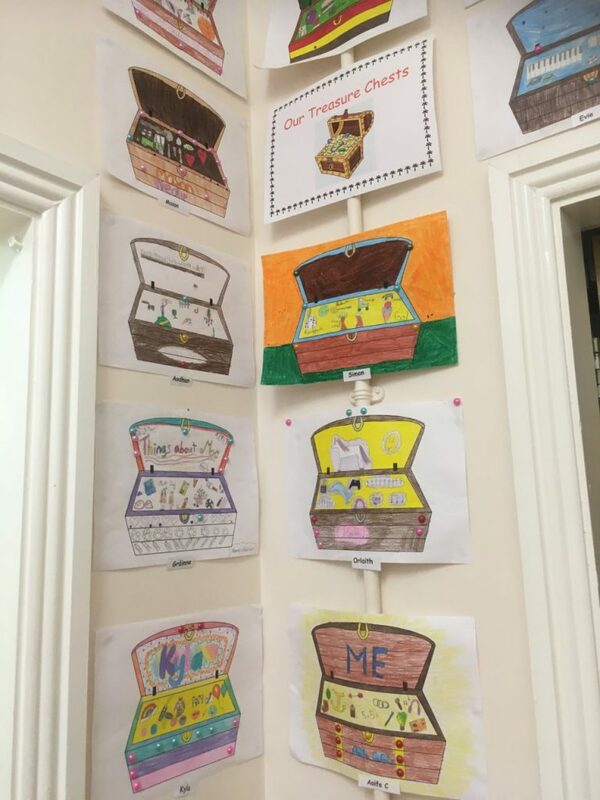 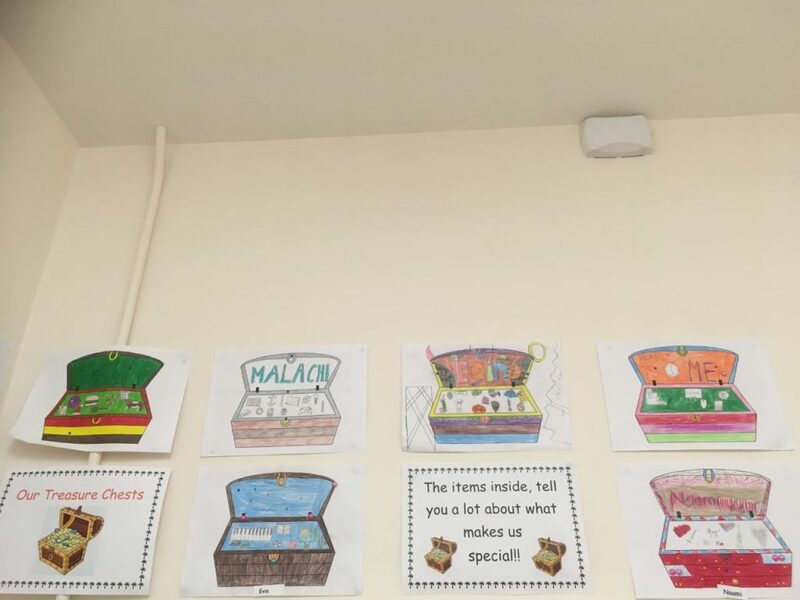 The children created their own treasure chests with pictures and symbols of what makes each of them special. 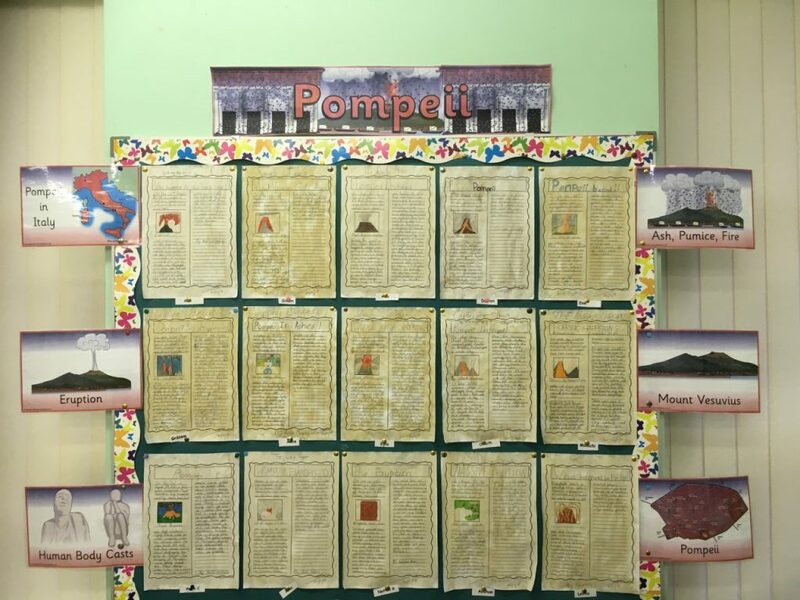 We looked at Pompeii in History and learned a lot about this ancient city. 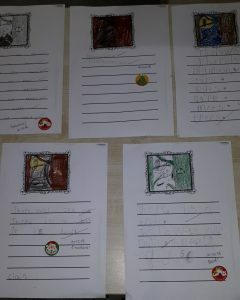 In support of all that they had learned on the topic, the children wrote their own historical newspaper report. 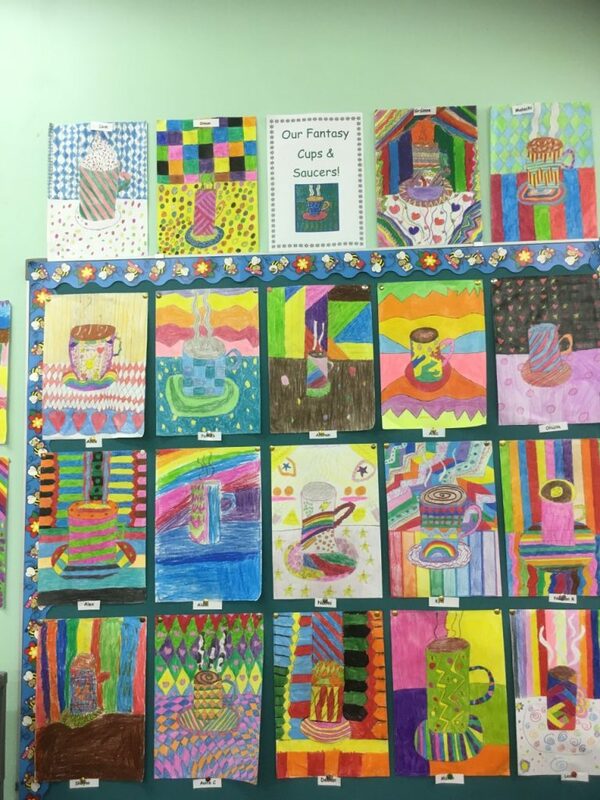 The children designed their own fantasy cups and saucers using various lines and shapes in Art. 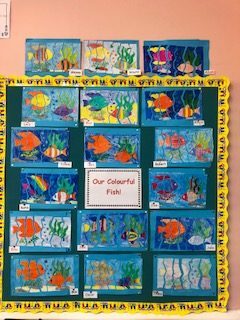 Didn’t they do a fantastic job! 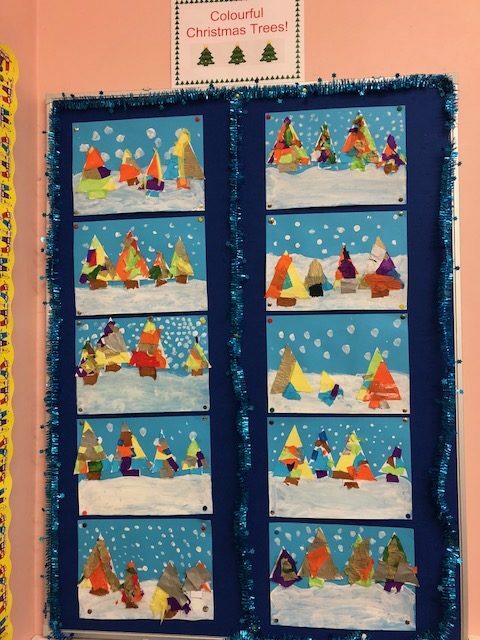 In preparation for Christmas, the children created lots of colourful art work and decorations for our classroom! 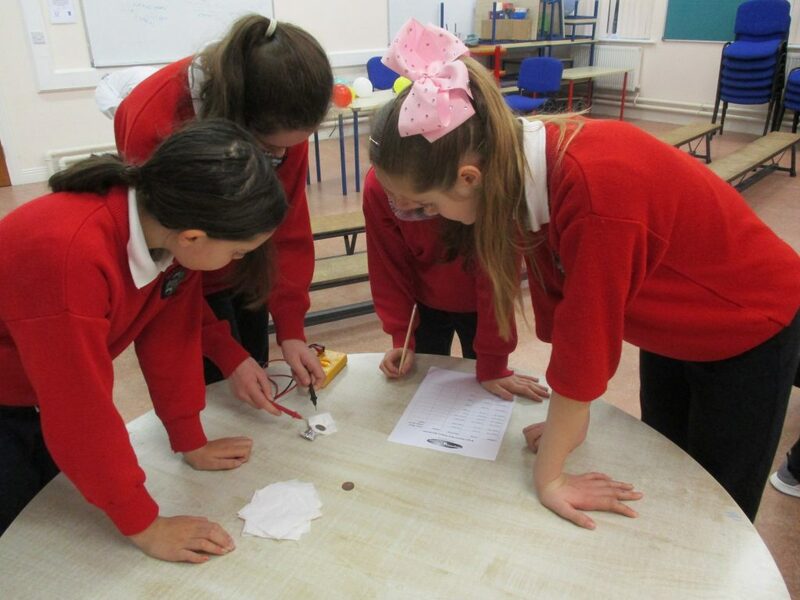 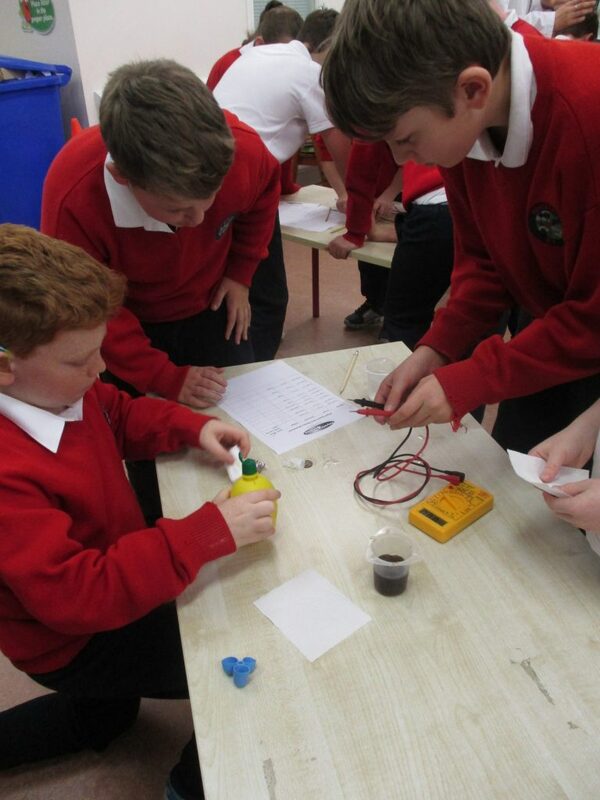 We received a free Science Workshop on electricity as a result of all our efforts recycling batteries last year. 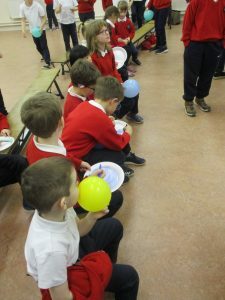 The children were actively involved in this workshop! 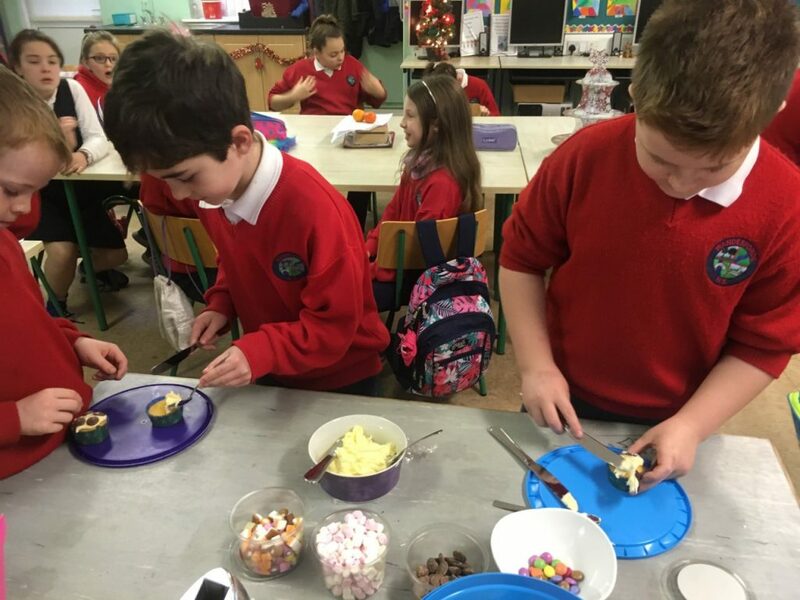 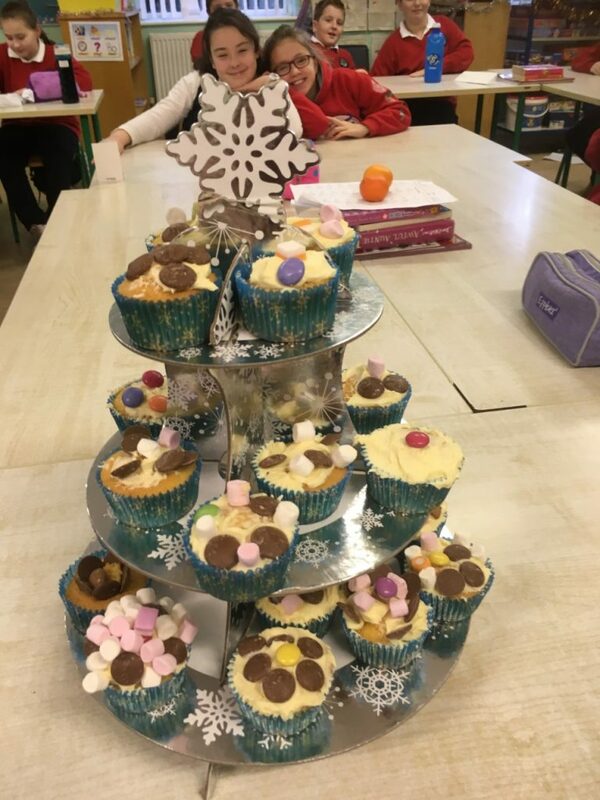 They also enjoyed decorating their own Christmas Cupcakes! 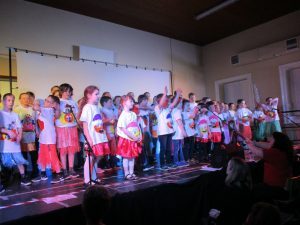 The children outperformed themselves in the Funky Kids Show. 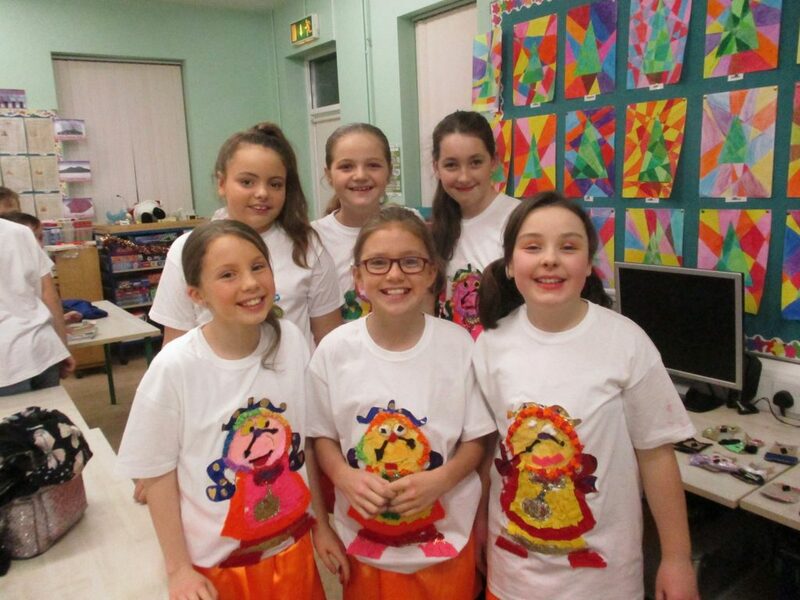 Well done on all your hard work in preparation for the night. 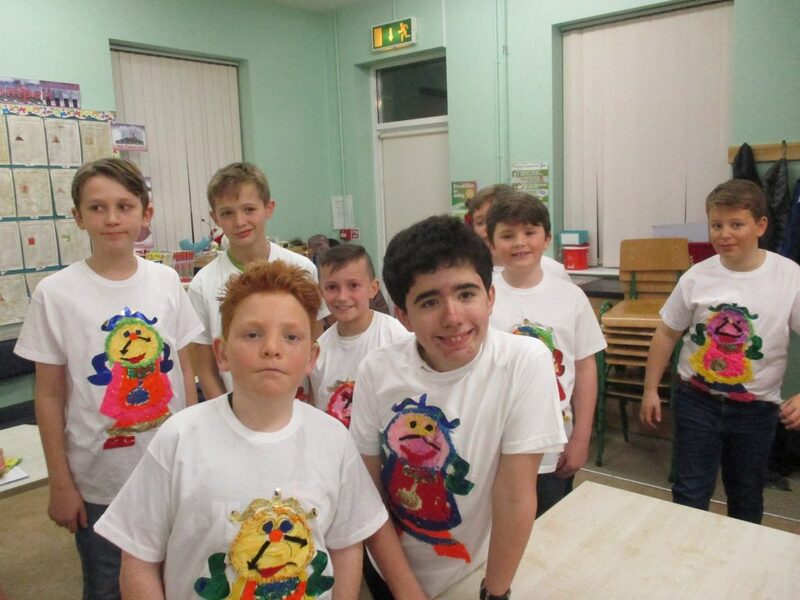 Thanks to Denis & Olivia of Funky Kids for their enthusiasm & support of the children during this 10 week workshop. 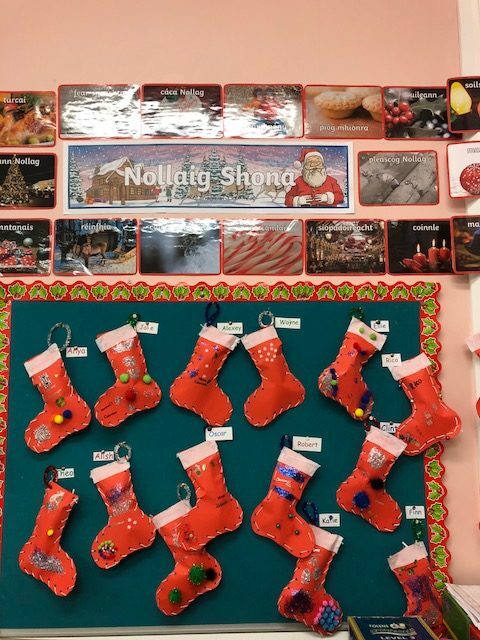 Well done Senior Classes on all your hard work in the lead up to Christmas. 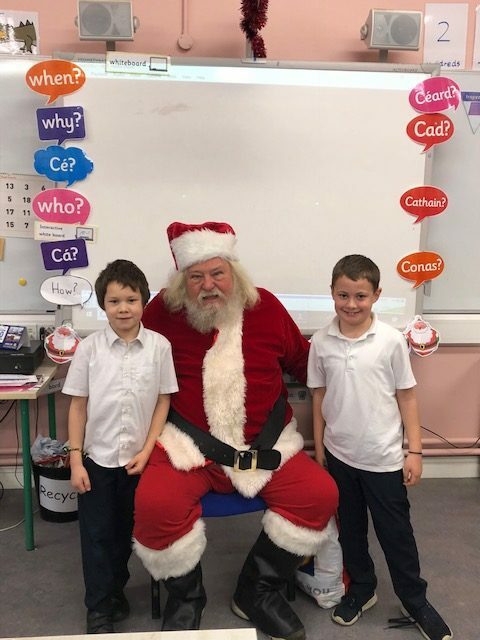 Enjoy your well deserved Christmas break and see you all in 2019!! 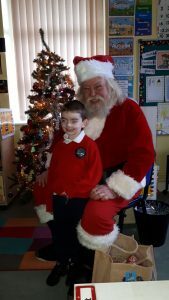 All is Merry & Bright in the Junior Room! 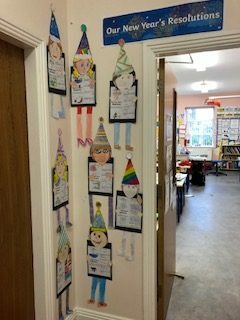 December has been full of fun in the Junior Room. 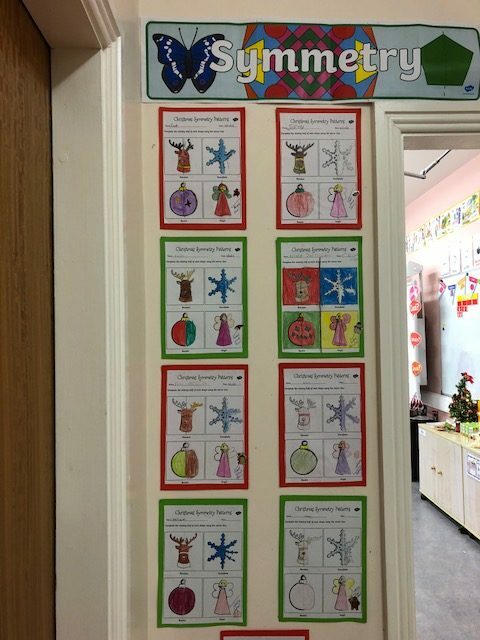 In Art and Religion we learned all about the story of The Nativity. 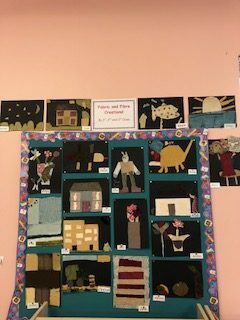 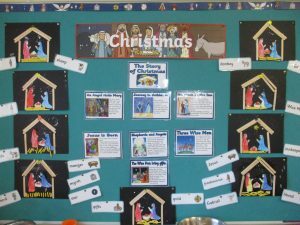 We created these lovely scenes of Jesus who was born in a stable. 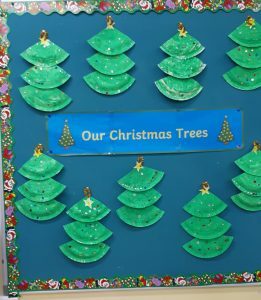 We also made sparkly and bright Christmas Trees from paper plates. 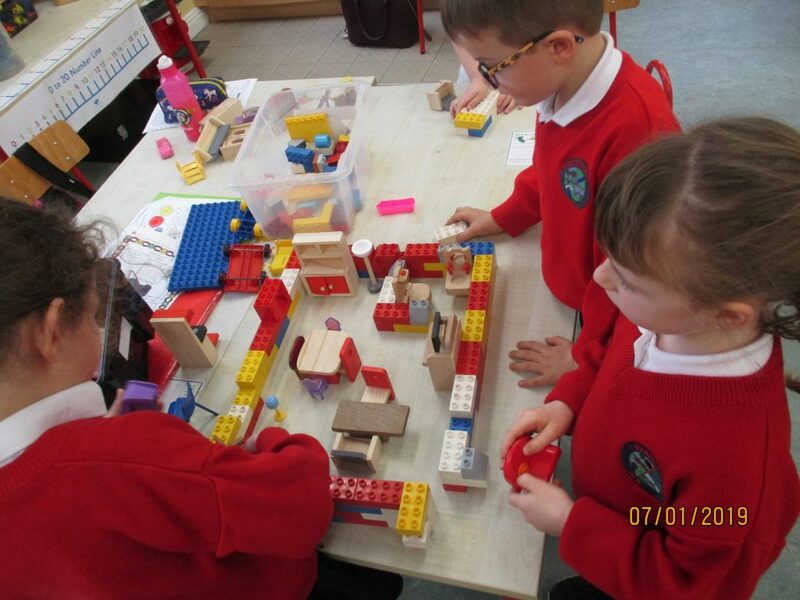 Our play topic was The North Pole! 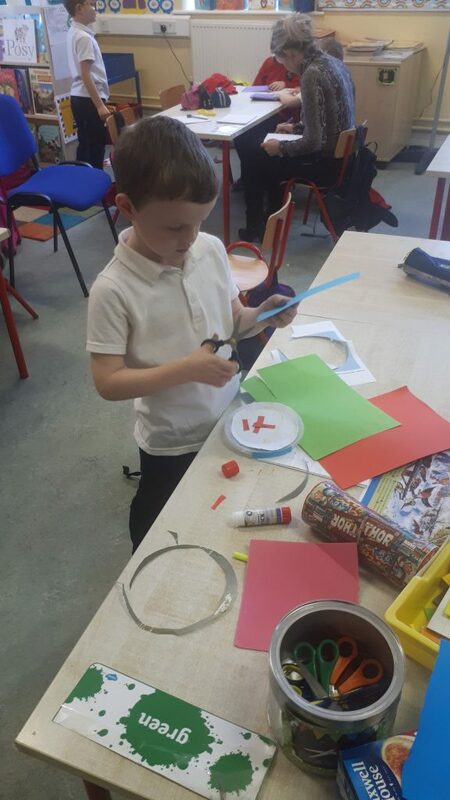 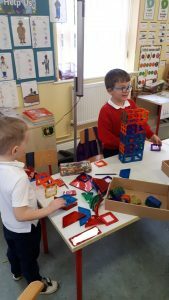 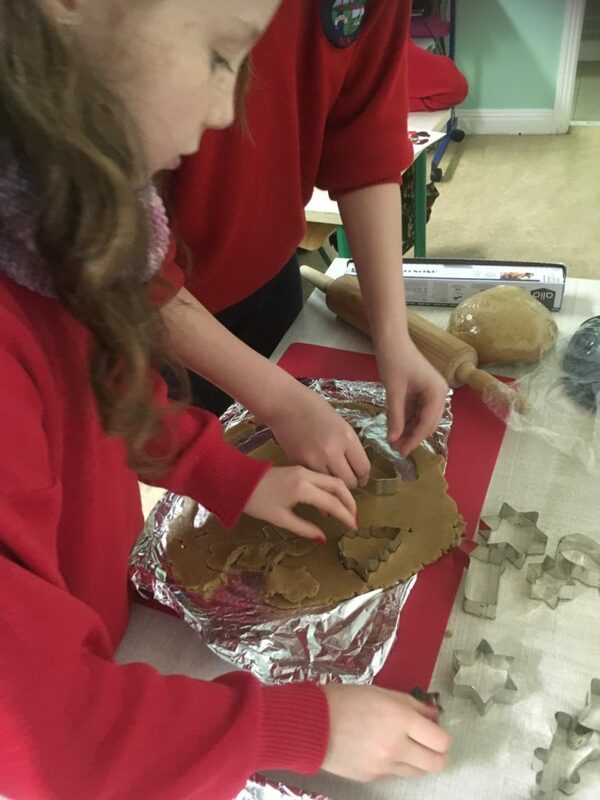 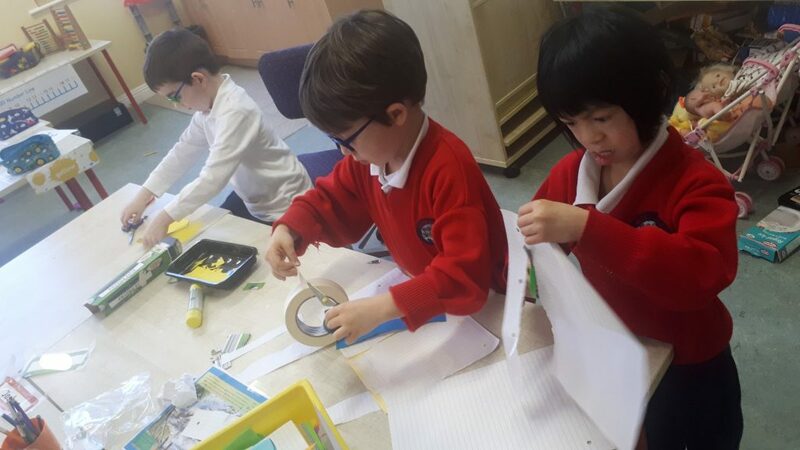 We had fun making presents in junk art, building Santa’s Workshop in construction, making decorations from play dough and creating a small world scene of the North Pole. 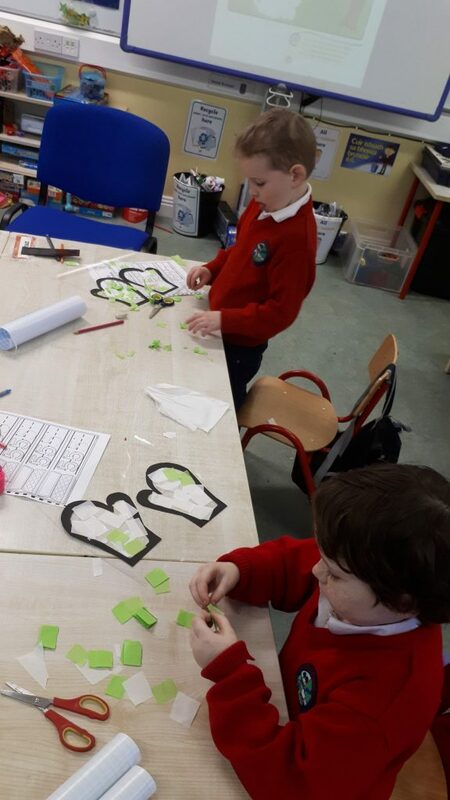 In Maths Senior Infants have been learning all about spacial relations and drew Rudolph in lots of different places like between the clouds and on the roof. 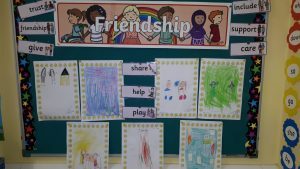 In SPHE we were learning all about being a good friend, we read stories about being a good friend and drew pictures showing us being good friends to our classmates. 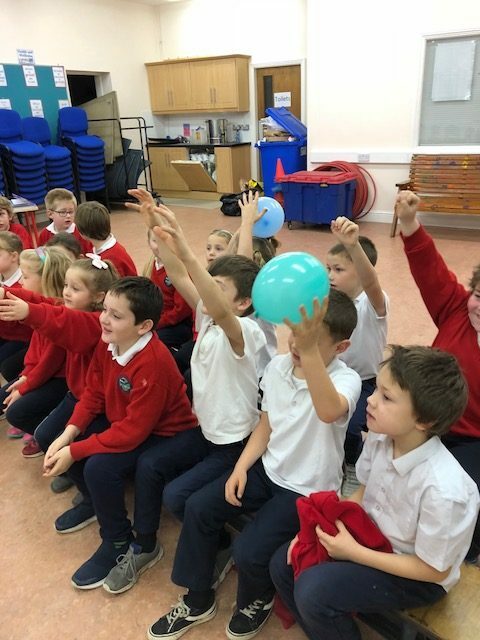 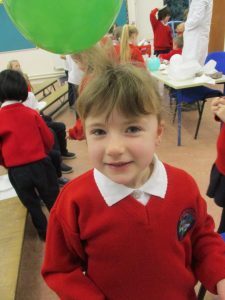 After learning all about electricity in November it was great to welcome Niamh from Anyone for Science to our school, she taught us lots of interesting information about static electricity. 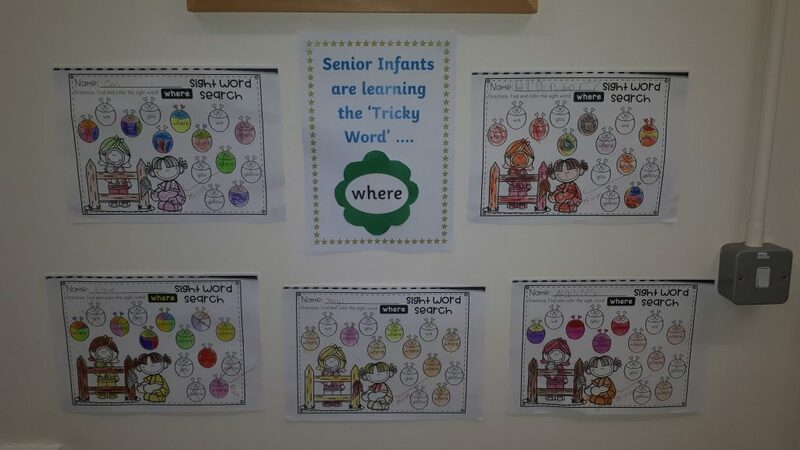 In English we read a poem ‘Twinkle, Twinkle Christmas Lights’ and coloured in Christmas lights & Senior Infants wrote sentences all about night time. 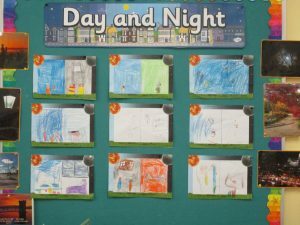 In SESE this month we have been looking at the differences between day and night. 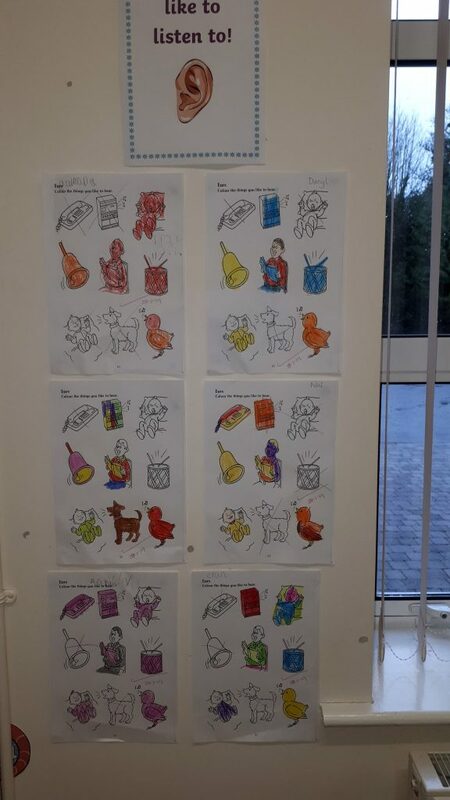 We drew pictures to illustrate these after playing a sorting game. 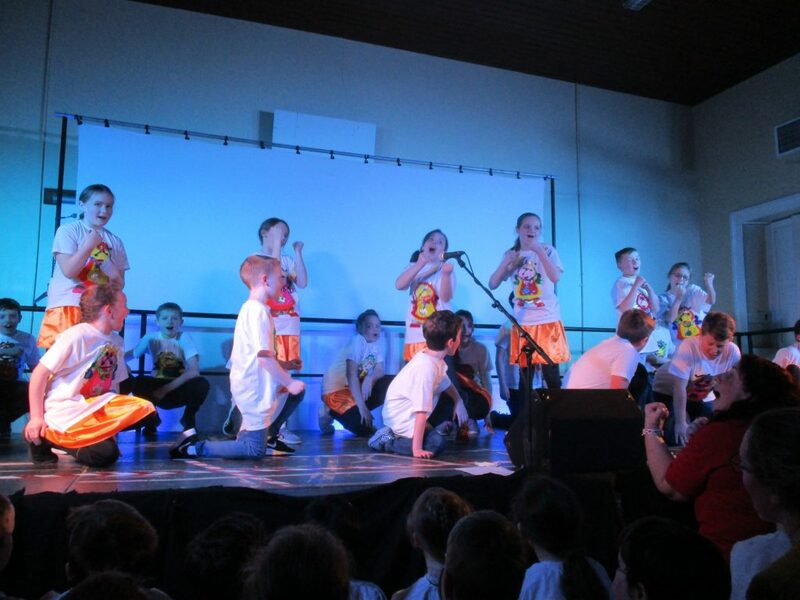 We had a super night performing our show with the Funky Kids! 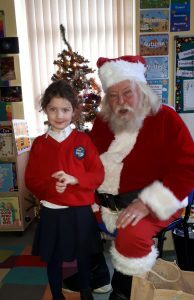 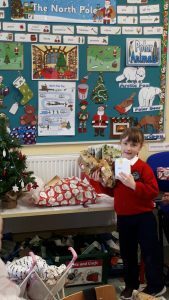 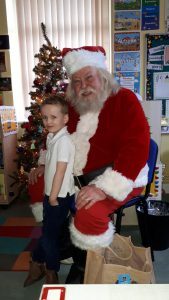 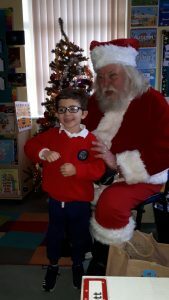 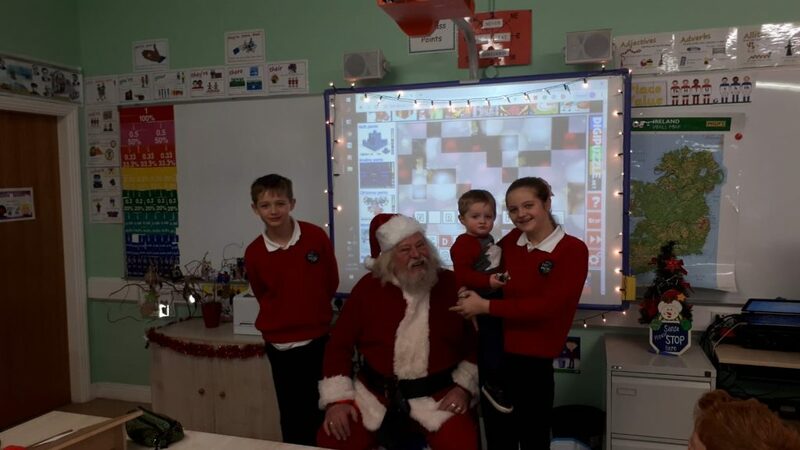 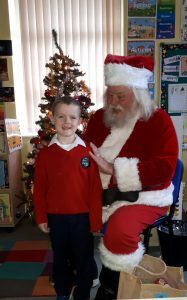 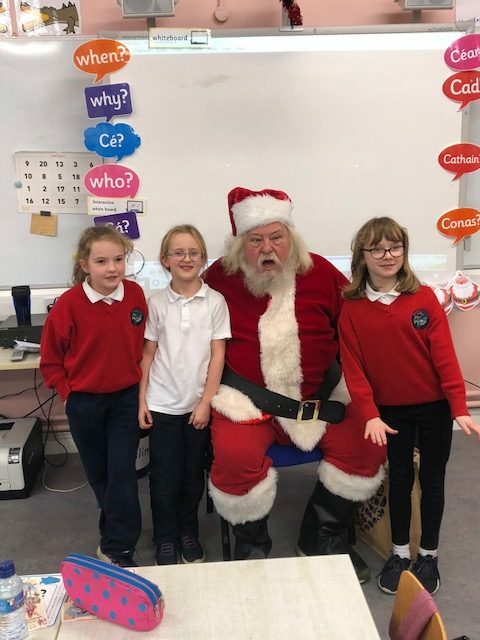 Finally we were very excited to welcome a special visitor to our class ……….SANTA! 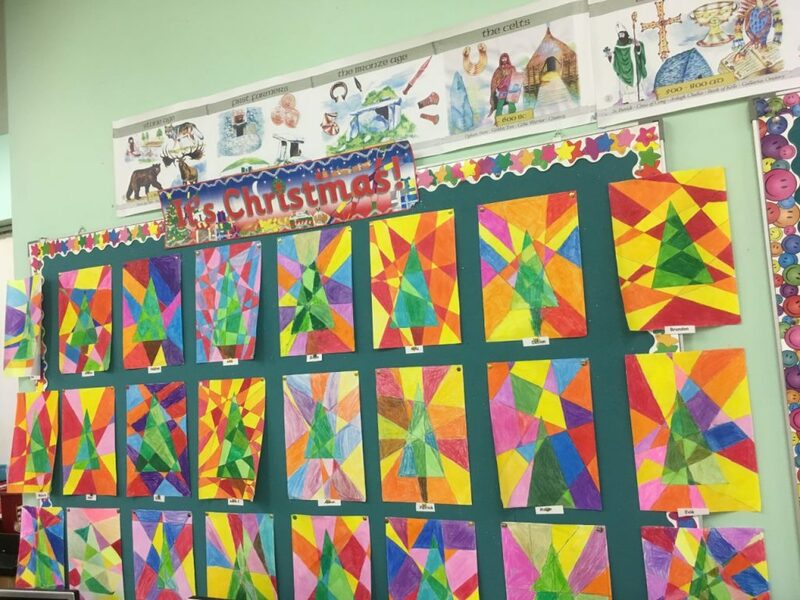 A Merry Christmas from the Middle Room! 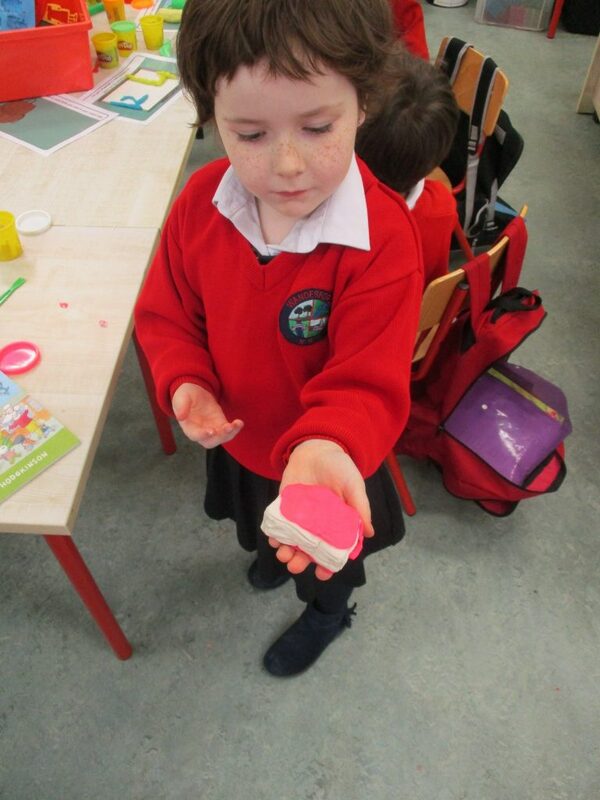 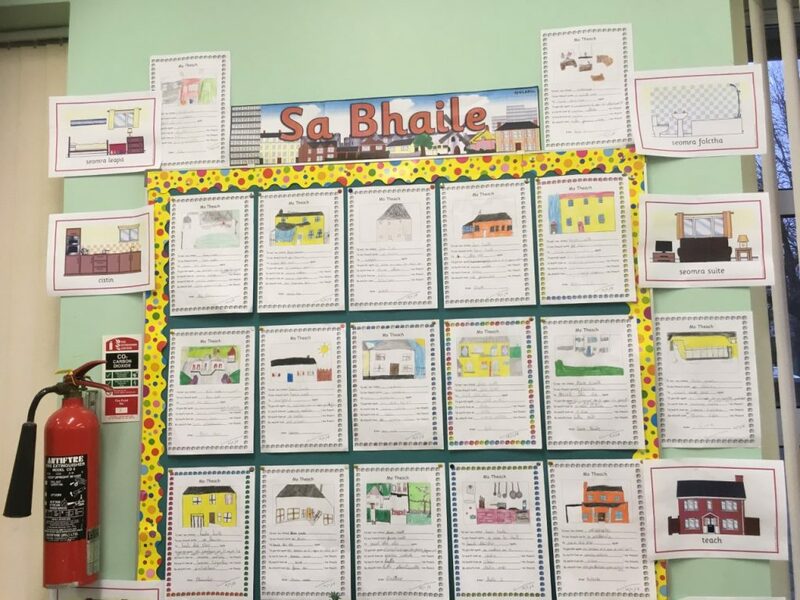 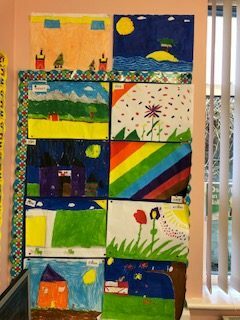 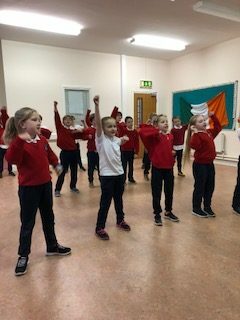 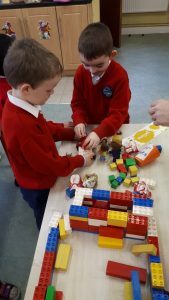 We have had a very busy month in 1st, 2nd and 3rd Class in Wandesforde National School. 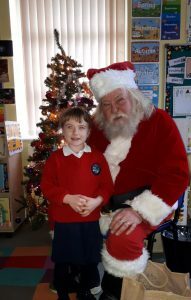 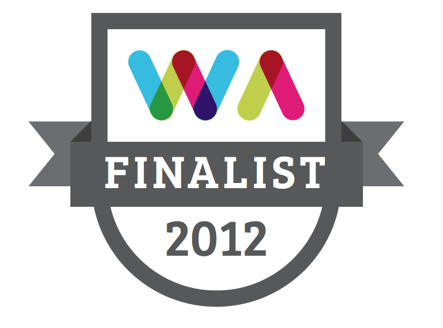 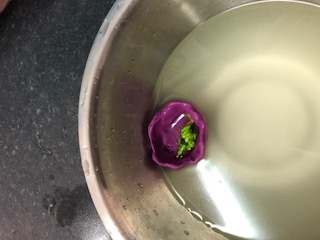 Have a look at all the wonderful things the boys and girls have been up to…. 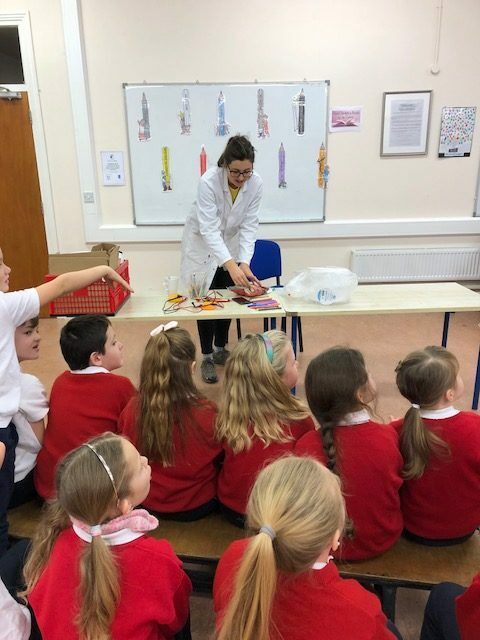 We had a visit from Niamh, a scientist with Anyone 4 Science and she talked about electricity with the children…. 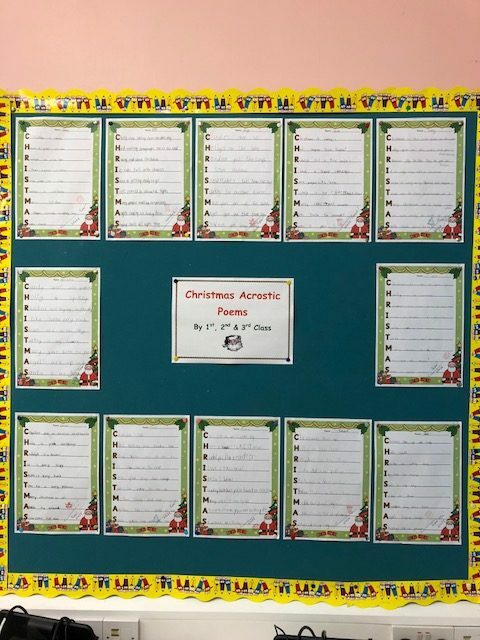 In English, we wrote Acrostic Poems entitled “Christmas”. 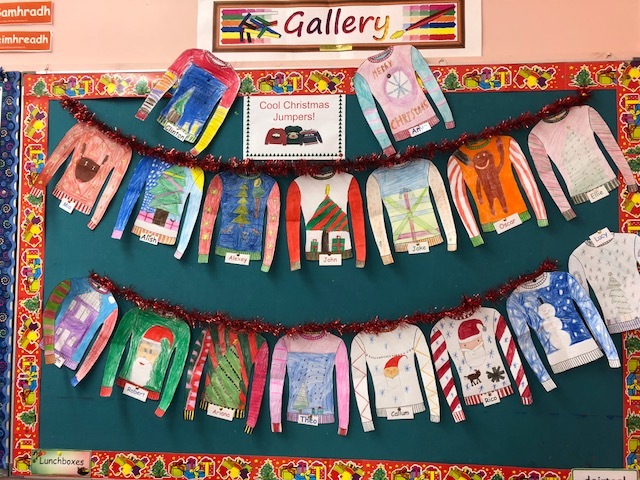 We also decorated Christmas Jumpers. 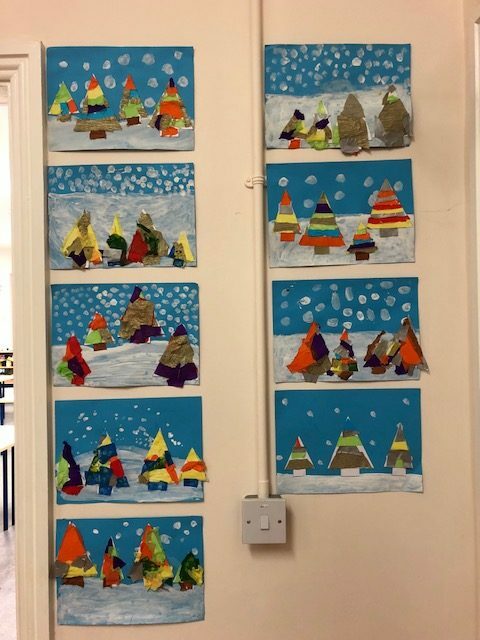 Don’t they look very festive?! 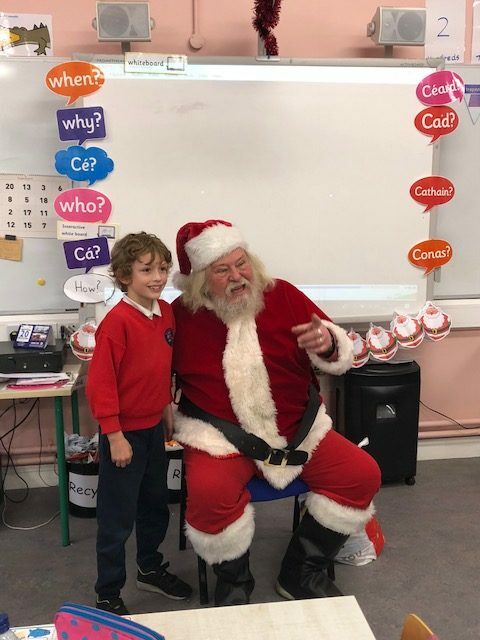 On Thursday, 20th December, we had the pleasure of welcoming Santa Claus into our classroom. 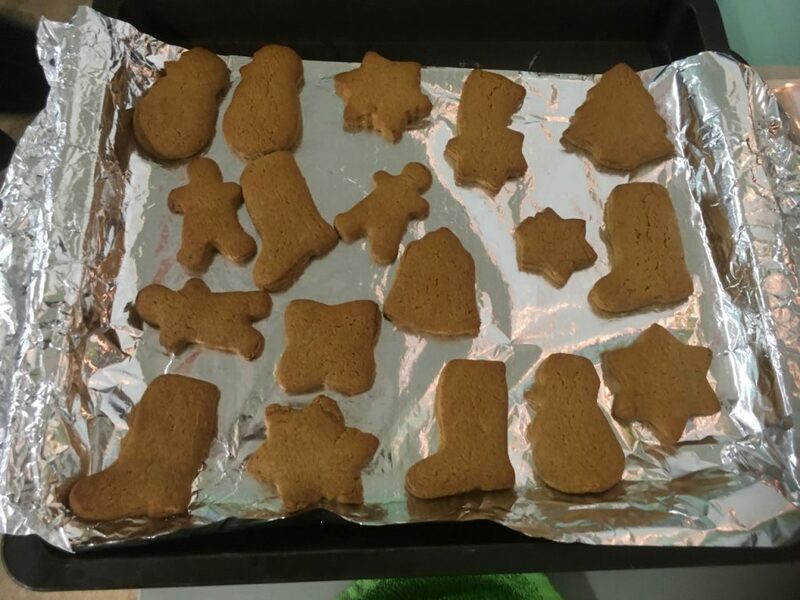 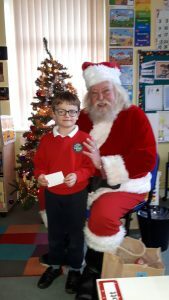 Although he is very busy at this time of the year, he still managed to get his photo taken with the children in our class and gave us all a treat too!